art, architecture design, designing bars and restaurants, urban sculpture, and interior design. Later, Alex got a degree in Architecture at the International University of Catalonia (UIC) and was responsible for Sustainable Construction at the UPC over four years. Similarly, Esther graduated with a Master’s in Project Management from the UPC and the Association of Technical Architects and Building Engineers in Barcelona. After years of working with DF-Studio, they decided to try their hand as residential developers focusing on “special housing,” which emphasized creating platforms for “After Living” and “Homy” lifestyles. This ultimately lead to “Diaz & Gallardo Unusual Real Estate”. Constant innovation, research and investigation of a “superior aesthetic level”, sustainability, and humanism are the core principles of their projects and promotions. We are a team composed of architects, interior designers, artists, photographers and craftsmen lead by Alex Díaz and Esther Gallardo. An all-in-one mix, a bunch of random, contradictory, complex and different people linked by a common goal: pure creative freedom. The result is an innovator network you won’t find anywhere else! We are “Made in Barcelona”. 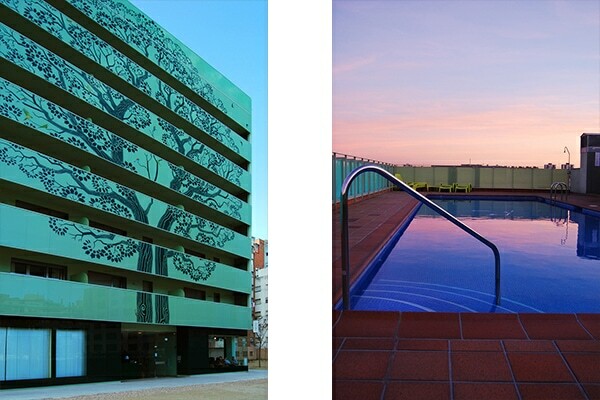 Diaz&Gallardo sells domestic properties for special people linked to contemporary living in Barcelona and Madrid. Those homes are dense, small, bright, delicate, sophisticated, sensual, funny, unique, exclusive, organic, smart, full of energy, surprising tips and, above all, highly attractive. Our aim is to restore the true Mediterranean lifestyle in downtown Barcelona and Madrid, by improving and strengthening ties between inhabitants, their street and outdoor happiness: “la buena vida”. WHEN DID YOU TWO TEAM UP AS BUSINESS PARTNERS AND WHAT ARE YOUR RESPECTIVE PROFESSIONAL BACKGROUNDS? We became business partners – and a couple – about 15 years ago. 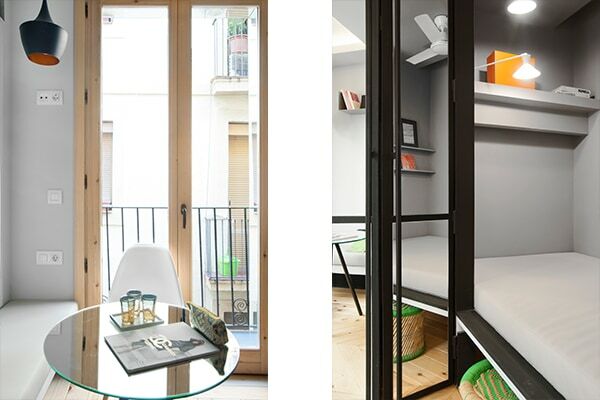 Our first office was in a coworking space in the center of Barcelona; an 8 sqm office! A tiny office. There, we really learned how to design and live in small spaces, haha! Both born in Barcelona, we studied and graduated with a degree in Surveying, Technical Architecture, and Building Engineering. Thereafter, we opened our first office, DF-Studio, which was a multidisciplinary studio for art, architecture, and design, designing bars and restaurants, urban sculpture, and interior design. Later, Alex got a degree in Architecture at the International University of Catalonia (UIC) and was responsible for Sustainable Construction at the UPC over four years. Similarly, Esther graduated with a Master’s in Project Management from the UPC and the Association of Technical Architects and Building Engineers in Barcelona. ON YOUR WEBSITE YOU USE THE TERM “ARCHITECT AS DEVELOPER.” WHEN DID YOU DECIDE TO COMBINE THE TWO PRACTICES? In 2008, the financial crisis began. In Spain, the housing “bubble” burst. At that time, we decided to try to create a business “without clients.” We found our own trust in our architecture to always be the best solution, so we decided to become developers of our own architecture: Architects as Developers. Now, we develop and sell and an average of 10-15 apartments per year. WHAT MADE YOU DECIDE TO FOUND DÍAZ & GALLARDO UNUSUAL REAL ESTATE? WAS THERE A PARTICULAR MOMENT THAT SEALED THE DECISION FOR YOU? The exact moment was in 2009. First of all, there was this absence of Spanish customers; second, came the search for freedom of design. Many times, customers clouded and modified our initial ideas for the project. We did not like this. Therefore, for certain projects, we decided to not accept more work from external clients. We became our customers. COULD YOU DESCRIBE THE PHASES OF ONE OF YOUR PROJECTS STEP-BY-STEP? The traditional process is reversed: the customer arrives at the end. After the first instance of purchasing a building or property, we try to develop a story about it. We imagine what kind of person might live there. We decide on all the little quirks and details; a “pret-a-porter” for an imaginary person. This fictional character then becomes the leitmotif for the project. We build and finally put the property on sale. It’s very, very peculiar that in 90% of the cases the buyer-client is very similar to the person we imagined living there. This is what we call “Unusual Real Estate”; it is a kind of pret-a-porter apartment without the clients who normally start the ball rolling. YOU WORK WITH AN INTERDISCIPLINARY TEAM. HOW MANY PEOPLE DO YOU EMPLOY AND WHAT ARE THEIR RESPECTIVE PROFESSIONAL BACKGROUNDS? In the office we are just two people: Esther and Alex. In construction, we employ 10 people: masons, carpenters, blacksmiths, and electricians. Recently, we have also hired a broker for our sales. For the photographs, we have two photographers. Alex also makes photographs from time to time. DO YOU HAVE A BETTER KNOWLEDGE OF REAL ESTATE DEVELOPMENT THAN OTHER ARCHITECTS? Esther, as Master Project Manager, has great knowledge of the real estate world and Alex designed a real estate agency in the final project for his Building Engineer degree. We are a rare species. In general, in Spain, architects do not have knowledge of real estate development. It is something new. 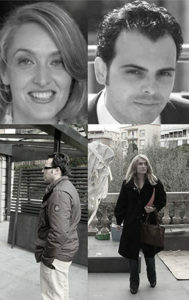 YOUR PROJECTS ARE ALL LOCATED IN BARCELONA AND MADRID. WHAT IS SPECIAL ABOUT THESE CITIES? WHAT SPECIAL DEVELOPMENT DOES THE MARKET DEMAND? The two cities are very beautiful and also very different. Therefore, customers who buy our homes also are different. 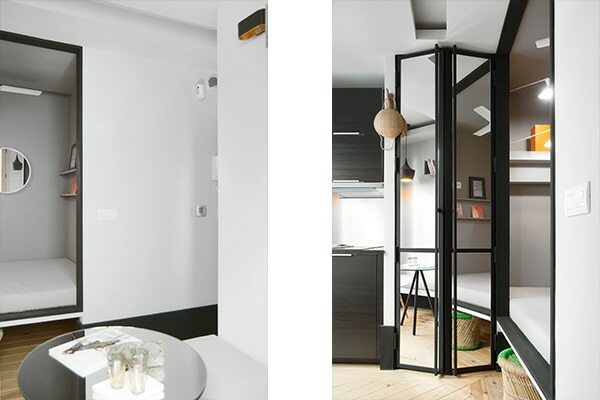 In Barcelona, our customers are either Central European or North American looking for a pied-à-Terre in Barcelona; to enjoy the city while on vacation. In Madrid, our client has another profile: the buyer is an investor who buys our properties and then rents them with a good return on investment for their designs and central location. In both cities, our homes are sold, “where things happen”: in the center of the metropolis. FOR FRESH ARCHITECTURE GRADUATES WHO KNOW VERY LITTLE ABOUT REAL ESTATE DEVELOPMENT, HOW WOULD YOU BREAK DOWN THE PROCESS OF GETTING THE FIRST PROJECT OFF THE GROUND? We wouldn’t dare to give advice! Perhaps to believe in your own ideas, but nothing more. HOW DO YOU CARRY OUT MARKET RESEARCH AND HOW DO YOU FIND LOCATIONS FOR YOUR PROJECTS? In the beginning, we used the Internet, but we no longer do that. Instead, we visit the places where we are interested in investing and speak with people who have business there. From these conversations, we find good locations and possible selling prices. We have done the reverse for many people, going from digital to analogic. We walk more than we browse on the Internet. We know the city, the streets and the buildings – that is our strong point. We have lived in these places for many years, so we have plenty of local experience. HOW WOULD YOU FINANCE A PROJECT IN ITS FIRST STAGES OF DEVELOPMENT? ANY TIPS ON HOW TO MANAGE IT? To finance the initial investment, we sold our home. If possible, it is, of course, better to finance it by itself. Working with banks can help, but repaying debts may delay recovery of the investment process. At some point, you will have to make important decisions that will sacrifice your personal and family life, certainly at the beginning. DO YOU HAVE ANY ADVICE FOR “ARCHIPRENEURS” WHO ARE INTERESTED IN STARTING THEIR OWN BUSINESS? Do it with conviction. Without fear of failure. We see a future for the architect as becoming more hybrid, and as breaking away from the traditional ideas of the profession. We see an architect who, in addition to designing buildings, is engaged in social and cultural problems, and not solely in problems to do with geometries and volumes. There are no politicians with a background of architecture yet (except the Mayor of Venice). We believe that this could be a great opportunity for architects in terms of social development. A lot of problems of cities and countries could be solved with urbanism. Like a surrealist poem. We are, perhaps, in front of the smaller multifamily building in Barcelona?? The challenge is tiny and huge at the same time. Re-enable the entire building. Unique, simple and complex at the same time. 4.5m x 4.5m and five floors, five accommodation, the approximate volume, almost a toy to get into the pocket. Small, but with greatness at the same time, and decided gesture. In a corner of the city of hidden beauty. Minimal but possible. With the “Petit Cabanon” in mind, we take the challenge of the minimum and essence. Create an urban oasis tiny five fully equipped housing units. Of course, no elevator, a building almost forgotten. The idea is to raise the dead. 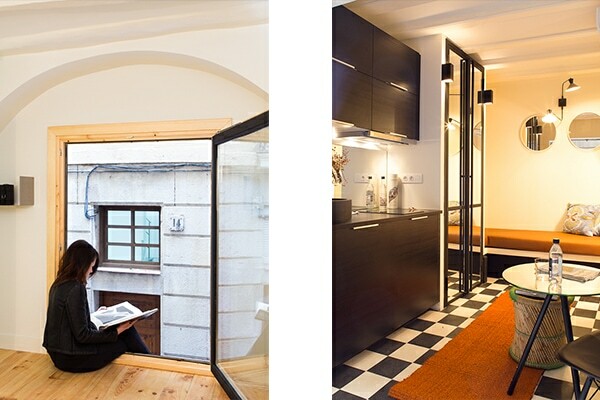 Give back to the splendor of 1853 in Barcelona. An experiment honest and willing habitat due to the lack of land in the city center. An attempt to minimum housing paradigm. A machine for living in the present. A former external environment, with a modern and comfortable interior. 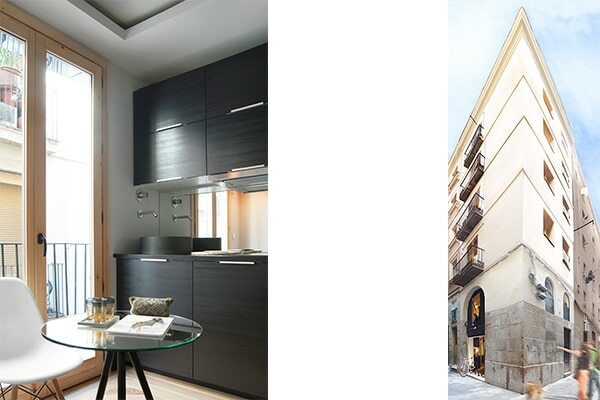 We like “city building” and therefore create a sensual mix of old to preserve and respect the lifestyle of Barcelona elements, along with a new modern image of urban living, a ‘pied-a-terre “. The aim is to improve the lives of people living in the building, an urban and central, friendly and above all, above all happy, very happy, connected with life on the street environment. The street is part of the housing. The authentic style of Barcelona, living in the streets, squares, etc. The “good life”. Urban seduction. We propose five residential units where you have everything hierarchical, reception, living room, kitchen, dining room, bedroom, storage, laundry, a real “box of surprises”. 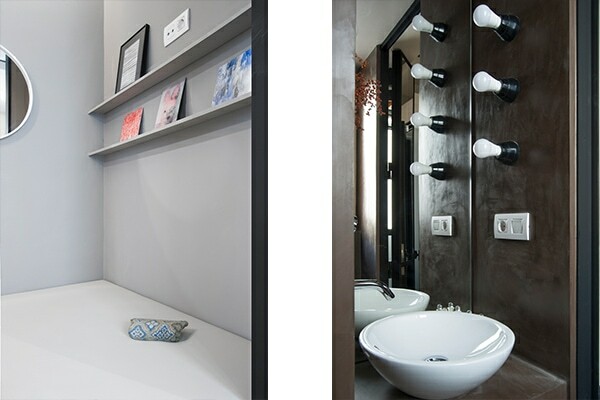 A small luxury high accomodations, ceilings illuminated in retro style, sensual textures, hall of mirrors. Something organoleptic. At a minimum, but it works. Open holes for light and windows. We also propose attention to detail and meetings. White, black, gold, beige, green, gray, brown. There is some Catalan, some of the aesthetics of graph Michael Sowa, and much of European in the final image of the interior. Those are our balanced influences. Small, central and very sensual. Almost like living in a fairy tale. Of course also the surprise, the corner and magic. Textures as contradictory priority, warm, dark iron, wood and strips cold. Microcement rough and smooth equalizer. White worn on aggregate. Transparent zoning. Solid but light walls. No gadgets. Transparencies and reflections as engines of design elements. Receiving light as other stuff. We receive it and reflect it. It then speak of a minimum housing unit ?? Everything works while you can cook, relax, read, sleep, enjoy, receive friends, really live, live, live, live, live and that’s it !!!. This “pocket building” is a proposal to livein a happily machine.